Shaenon: Oh my gosh, look at this! 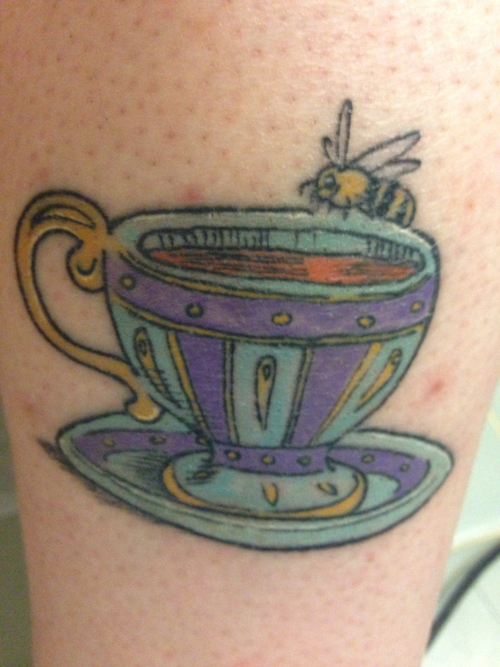 I did a sketch of Gavotte enjoying a nice cup of tea for Valerie Kaplan, and she went and TATTOOED IT ON HER ACTUAL BODY. This is, to my knowledge, the first time someone has gotten a tattoo of my artwork, and I couldn’t be more excited. This is awesome! Awwww I want it too! It is best to light upon the teacup. So many thinkonium components get hot. Hope it’s still recognizable in 50 years. I miss Gavotte. I hope she returns someday. Tea Bee or not Tea Bee, that is the question. I wonder if this counts as a tribute to Manchester considering all the Bee tats that were getting done. For a Skin Horse tattoo I’d get Unity showing how she could play a mad scientist at the Institue: “I’d like to be under your skin . . .” Or something like that. I couldn’t figure out what chapter it’s from. It’s from Mixed-Up Files. It took me *ages* to find when I was looking up panels of Sweetheart driving the drone, I couldn’t remember the title. Ah, that’s it. Not quite as apt a quote as I remembered, but I really do enjoy that one. I’m impressed at how faithfully the tattoo artist rendered Shaenon’s work. I could tell it was her style without actually seeing the original. I am planning to get some more bees (just the bees) scattered about my body. Sparsely covered in beeeeees! Missed your strip terribly. I’ll find an email recipient at the corporate hq and I will be quite clear, their dereliction is unacceptable.